Hi, Good Morning, Thank you all friends and viewers, Today I will post how to make papdi chaat recipe. I have learned it from another food blog: spiceupthecurry. I followed most of it from this blog. It is very tasty and simple recipe. But it involves lot of preparation. So I make it very rarely. Of course, if all the neccessary chutneys are readily available, we can make it easily. The preparation of chutneys can be done a day before. Now a days we are getting everything from the stores. So get them, prepare and serve them. Enjoy it with family members anytime. Of course making all of them with our own hands is really different and gives immense satisfaction. For that we need to make all of them a day ahead, papdi, green chutney, tamarind chutney, sev, curd and boiled potatoes (of course they are always available in my refrigerator). Chutneys can be refrigerated in an air tight containers for a week. Sev and papdi can be served as normal tea time snacks also if not using them for chaat. 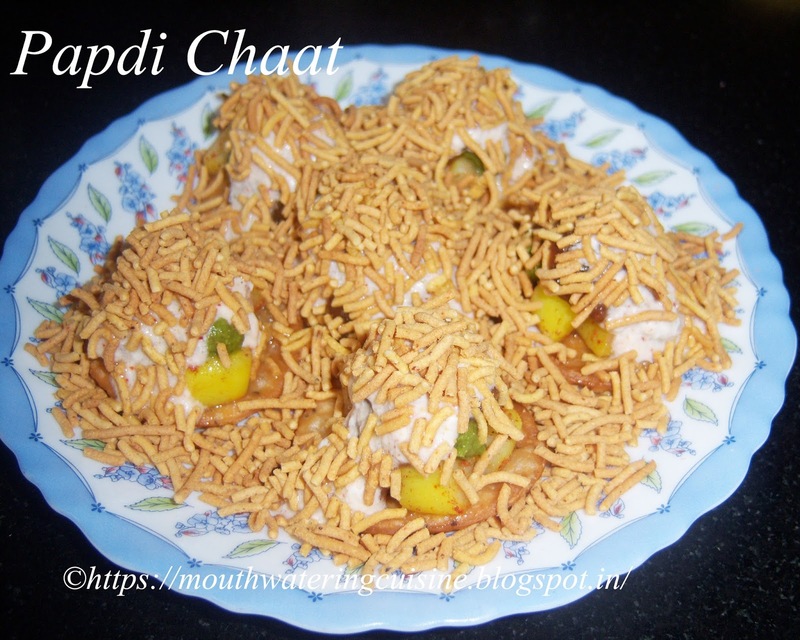 Papdi Chaat -- Crispy papdi topped with curd and masalas. Add salt, red chillies powder, garam masala, aamchur powder and coriander powder to the potatoes. Mix them well so that all the spice powders well coat to potato pieces. Keep it aside. In a bowl mix curd with the spice powders, salt, red chilli powder, coriander powder, garam masala and aamchur powder. Mix this also well and keep aside. Keep sev,green chutney and tamarind chutney readily available. In a serving plate arrange 4 or 6 papds, side by side. Top them with potato masala, then one spoon of green chutney. Then on top of it place one spoon of tamarind chutney. On top of them pour one spoon of flavoured curd. Then drop generous amount of sev on top of each papdi. We can change the amount of chutneys, flavoured curd and sev according to our taste. For more street foods click here.Thank you for visiting my blog. Hope you liked all my recipes. Any feedback and comments are appreciated.